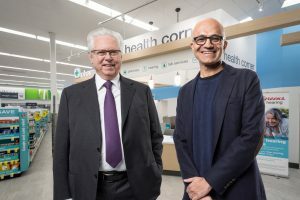 DEERFIELD, Ill. — Walgreens Boots Alliance (WBA) and Microsoft Corp. have teamed up to develop new health care delivery models, technology and retail innovations to advance and improve the future of health care. The companies will combine the power of Microsoft Azure, Microsoft’s cloud and artificial intelligence platform, health care investments, and new retail solutions with WBA’s customer reach, convenient locations, outpatient health care services and industry expertise to make health care delivery more personal, affordable and accessible for people around the world. Current health care systems are a complex combination of public and private sector organizations, providers, payers, pharmaceutical companies and other adjacent players. While there has been innovation in pockets of health care, there is both a need and an opportunity to fully integrate the system, ultimately making health care more convenient to people through data-driven insights. This is what brought WBA and Microsoft together. Through their strategic partnership, the companies will deliver innovative platforms that enable next-generation health networks, integrated digital-physical experiences and care management solutions. As part of the strategic partnership, the companies have committed to a multiyear research and development investment to build health care solutions, improve health outcomes and lower the cost of care. This investment will include funding, subject matter experts, technology and tools. The companies will also explore the potential to establish joint innovation centers in key markets. Additionally, in 2019 WBA will pilot up to 12 store-in-store “digital health corners” aimed at the merchandising and sale of selected health care-related hardware and devices. The integration of information will enable valuable insights based on data science and AI that can allow for fundamental improvements such as supporting the transition of health care data into more community-based locations and sustainable transformation in health care delivery. By better connecting people, providers and the systems in which they work, the industry will be able to provide better-quality patient care.